How To Handle Your Shy Child? As a behavioural trait that is much debated and often misunderstood, shyness is something that most people often misinterpret. Shy children very often get labelled as timid or even under confident. As parents, you can help your child overcome his or her shyness. Here is a handy guide. Bonding with others is always a natural phenomenon and there is nothing artificial about it. As a parent, please be aware that you can only set the stage for bonding, but cannot create bonds among children. So, to set the stage, please socialize yourself more and more. The more you interact with your peers, the more children open up to their surroundings. “You can also plan play dates among children but please be careful not to make it a crowded affair for children. Shy children enjoy company of very few, so a good idea is to let them create bonds with one or two of their favourites,” says Krishnan. Encouraging the child to develop a more social behaviour must be done slowly and be carefully monitored. “Don’t make your child go straight into the arms of a less familiar adult. Instead, encourage the adult to play with a toy near your child and use a calm voice. 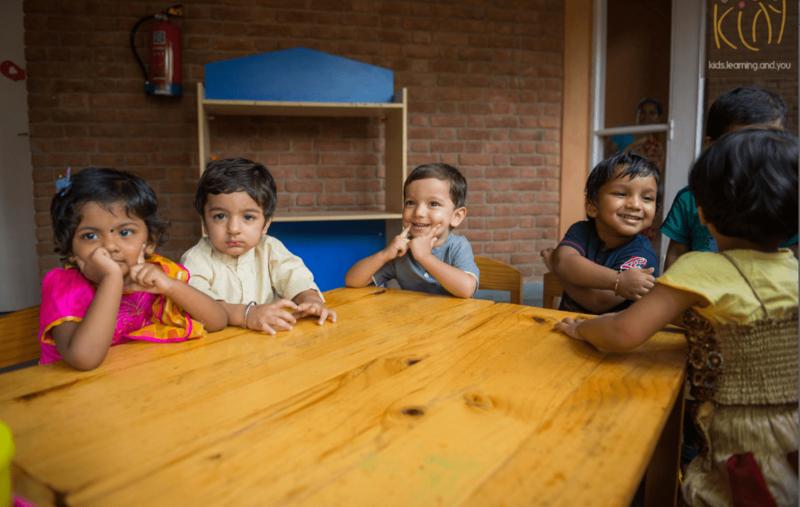 Stay with your child in social situations, such as playgroup or parents group, while encouraging her to explore. As your child gets more comfortable you can gradually move yourself away for short periods. 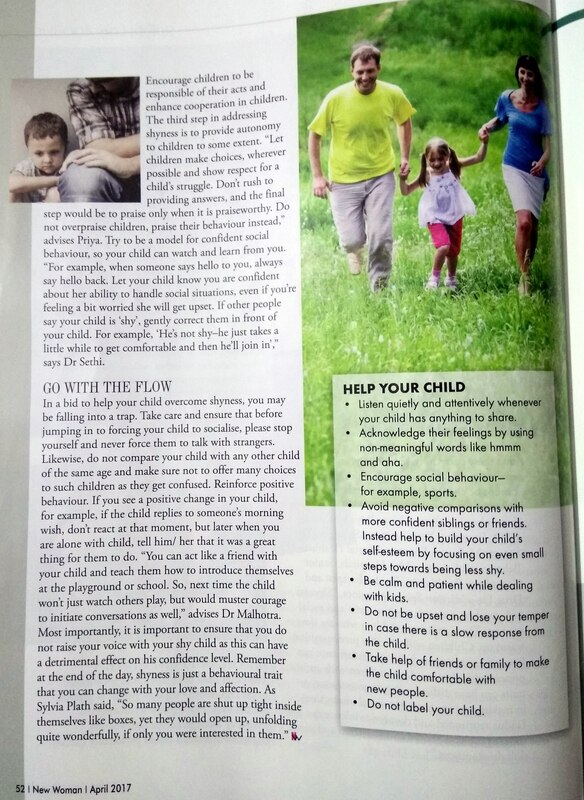 Just come back before your child gets upset so her experiences of venturing out are positive,” says Dr. Anil Sethi, Motivator, Psychologist & Life Coach, www.siemservices.com. The second need of children is to get engaged in constructive support system of parents. Studies show that shyness when targeted indirectly through encouragement and engagement leaves a child’s personality quickly. Encourage children to be responsible of their acts and enhance cooperation in children. The third step in addressing shyness is to provide autonomy to children to some extent. “Let children make choices, wherever possible and show respect for a child’s struggle. Don’t rush to provide answer and the final step is to praise only when it is praiseworthy. Do not over praise children, praise their behaviour instead,” advices Priya. Try to model confident social behaviour so your child can watch and learn from you. “For example, when someone says hello to you, always say hello back. Let your child know you are confident about her ability to handle social situations even if you’re feeling a bit worried she will get upset. If other people say your child is ‘shy’, gently correct them in front of your child. For example, ‘He’s not shy – he just takes a little while to get comfortable and then he’ll join in’,” advice Dr. Sethi. Listen quietly and attentively whenever the child comes and shares anything. Acknowledge their feelings by using non-meaningful words like hmmm and aha. Encourage social behaviour – for example, sports. Avoid negative comparisons with more confident siblings or friends. Instead help to build your child’s self-esteem by focusing on even small steps towards being less shy. Be calm and patient while dealing with kids. Do not be upset and lose your temper in case there is a slow response from the child. Take help of friends or family to make the child comfortable with new people. Do not label your child. 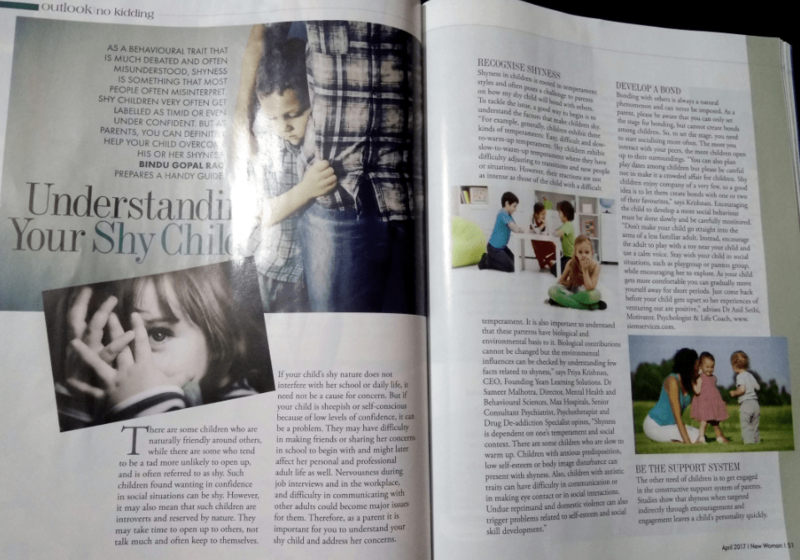 By BinduIn New WomanTagged Child, children, Director - Mental Health and Behavioural Sciences, Dr Sameer Malhotra, Dr. Anil Sethi, Max Hospitals, Motivator, parent, parenting, Psychologist & Life Coach, shy, shyness, www.siemservices.com10 Comments on How To Handle Your Shy Child? Next Next post: How to be friends and business partners at the same time? Thanks so much! I hope this helps you in a small way at least. Also this is my 100th comment! Thanks again! thank you so much for the great blog and useful information.